Everyone in the public eye, especially presidents, say things from time to time that are funny, whether they were intentional or not. Ronald Reagan was famous for many things, including his humor. like when he was asked how can an actor be president, he replied, "How can a president not be an actor?" like after the assassination attempt he said to his wife, "Honey, I forgot to duck." 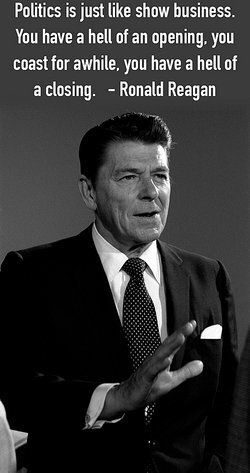 The following funny Ronald Reagan quotes are sorted into two groups, one political with the other containing humerous quotes from other aspects of his life. We are trying to get unemployment to go up, and I think we're going to succeed. Politics is just like show business. You have a hell of an opening, you coast for awhile, you have a hell of a closing. Ronald Wilson Reagan was born in Tampico, Illinois on February 6, 1911. He went to Eureka College and afterwards, worked as a sports announcer on the radio. He acting career started with a screen test in 1937. During his lifetime, he appeared in 53 films. The Screen Actors Guild elected him president two separate times, in 1947 and 1959, and soon after that, he got involved in politics. He served as governor of California from 1967 to 1975. He ran for the Republican presidential nomination twice, in 1968 and 1976, and was defeated. He tried again in 1980, winning the nomination and the presidency. As president from 1981 to 1989, he initiated economic reforms which were called "Reaganomics." These reforms cut government spending and taxes, and helped the economy to grow. Also, jobs were created and the nation's defenses were improved. While he was in office income taxes were revised, which meant millions of poor people were exempt from paying taxes. During his second term, defense spending was increased because he felt that peace comes through strength. He also declared war on international terrorism, sending troops and bombers wherever necessary, like Libya and the Persian Gulf. His term ended in 1989 and he left with the highest popularity of any president since Franklin D. Roosevelt. He was diagnosed with Alzheimer's disease in 1994, and died at the age of 93 in his home in Bel Air, California on June 5, 2004. "Funny Ronald Reagan Quotes." YourDictionary, n.d. Web. 21 April 2019. <https://quotes.yourdictionary.com/articles/funny-ronald-reagan-quotes.html>.